As his presidential campaign starts to sink in its own mire, Scott Walker is becoming increasingly extreme in an effort to keep it afloat. In regards to Iran, Walker had come out against the deal even before it was crafted, saying he would blow it up on Day One in office. More recently, he started saber rattling, saying that he would consider military action on Day One. If Walker hadn’t dropped out of college perhaps he would have learned about the Logan Act which prohibits private citizens from meddling in foreign affairs. A violation of the act is a felony. Being a president-elect does not confer any special status. A president-elect is just a private citizen up until the day of the inauguration. But again, he was absent that day in school. 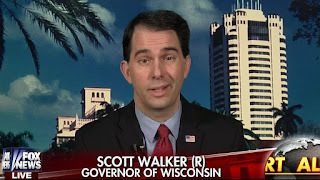 So where is Walker coming up with such nonsense, albeit dangerous nonsense? 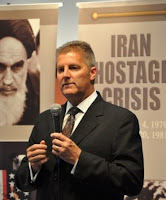 Walker has cited Hermening many times, including in his presidential kickoff speech.. Hermening was one of the 52 marines that were held hostage in Iran for 444 days from 1979 to 1981. With Walker's status as a Republican frontrunner — not to mention a potential president — the introduction of Hermening as the face of his Iran policy was significant. While Walker has been mentioning Hermening for months during his stump speeches, his kickoff speech set the tone for his campaign. Walker and Hermening are on the same page when it comes to the deal worked out by the Obama administration and other world leaders, which would end sanctions on Iran in exchange for controls on nuclear arms development. One thing about Hermening though - he just might be even more extreme than Walker. In 2001, Hermening wrote an op-ed piece in which he advocated for the immediate deportation of all illegal immigrants, especially those of Middle Eastern descent. Hermening also said that the United States should bomb the hell out of the capitols of Afghanistan, Iran, Iraq, Lebanon, Libya, Sudan and Yemen - even to the point of using nuclear weapons. Well, certainly Walker wouldn't stand with such insanity, right? A Walker campaign spokeswoman stood by Hermening when asked about the views expressed in his opinion piece. AshLee Strong, press secretary for Walker, emphasized that Hermening was one of 52 Americans held hostage for 444 days more than three decades ago by militant Iranian students. He was a 20-year-old Marine sergeant stationed at the U.S. Embassy in Tehran at the time. "Mr. Hermening has bravely served our country, and any attacks on this service are shameful," Strong said. She did not respond to particulars of Hermening's foreign policy positions. "I'll speak for myself," Walker told the Journal Sentinel on Monday. "The reference I made to Kevin Hermening was as one of the hostages, the youngest at the time, and pointed out the things that hadn't changed. My policy is very clear, and it's not aligned with what he said in that particular column." He said he does not consider Hermening an adviser, even though his campaign has featured him prominently. Hermening said Walker campaign manager Rick Wiley had arranged an interview with The Associated Press that ran last week that featured Hermening as the face of Walker's foreign policy. 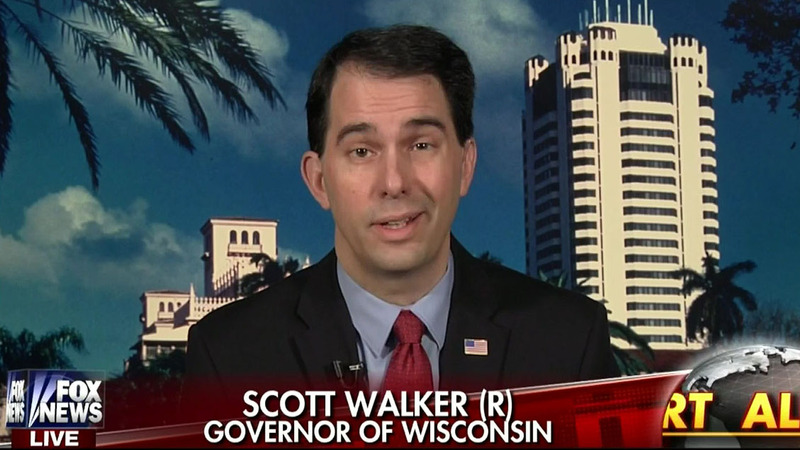 Now, it could be that Walker is using this rhetoric as red meat for his base. It could be that he is trying to reassert his manhood after getting slapped down by Donald Trump. But given the fact that Walker is nothing more than a coward and bully - the biggest example being the sneak attack he did on Wisconsin workers, which he set up even before he took office - one shouldn't put it past him to do something totally irresponsible and reckless and immoral as starting a war in the Middle East. Walker does not have the leadership skills needed to negotiate with anyone and would rather sucker punch them first. I know I wouldn't trust him with a BB gun, much less the command of the world's most powerful military or the keys to any nuclear missiles. Attorney General Brad D. Schimel is running a SHAM conference tomorrow so that he can do the dirty work of destroying Wisconsin's open records laws. The dog and pony show, labeled an "Open Government Summit" is pure propaganda designed to take the heat of Vos, Fitzgerald, and Walker when upcoming legislation is introduced to make it impossible for anyone to find out what the Republicans are doing. He thinks he can interfere "the day after the election" because as Governor-elect he had enough influence that Jim Doyle stopped all work on the High Speed Rail expansion in Wisconsin. Gah! Governor ToolJob thinks he's learned from experience! KH failed to protect the embassy and has continued as a failure ever since. The irony is that KH was held much longer as a hostage than Carter's negotiations could have brought him home -- only because Reagan's campaign violated the Logan Act and undercut those negotiations, promising the Iranians an arms deal (what became the Iran-Contra Scandal) if the hostages were held until after Carter left office... and they were released on Reagan's Inaugural Day.